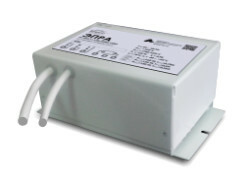 Helios Electronic Ballast (Helios EB) is a device that uses semi-conductor components to operate a sodium discharge lamp. It has a built-in PLC modem that allows to control each lamp remotely. Lighting division into groups based on importance, light intensity, movement or time.